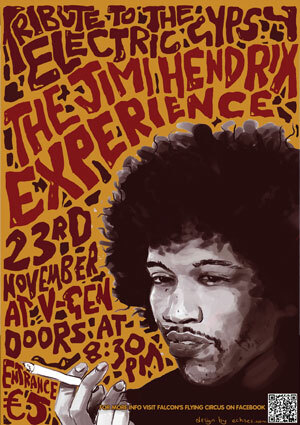 Falcon’s Flying Circus proudly presents The Jimi Hendrix Experience. Tribute to the all-time guitar wizard a few days before his 70th Birthday! So boys and girls here’s what’s going to happen! As a starter, the place is turned into a lounge where one can chill-out and relax. During the night a projector will be in place showing concerts and documentaries of the legend. We would also like to introduce a particular set-up by displaying some paintings of local artists as a small exhibition and encourage some diversity as art meets music! Artists interested in showing their talent in the night are free to contact us for more details. Finally, the place will be turned into a big party with Falcon’s Flying Circus playing a full set list tribute to The Jimi Hendrix Experience and the music of Jimi Hendrix throughout his life. This is gonna be a big blast for all Jimi fans out there! (2) A bag of super buzz! (3) Lay back and Grooveeeeeeeeeeeeee !